What do Harry Potter, Catcher in the Rye, A Wrinkle in Time, A Light in the Attic, and Call of the Wild have in common? For one, they’re all great works of literature. And, according to the American Library Association, they’re all frequently challenged books, too. 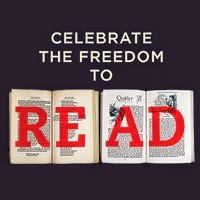 We think the freedom to read what we choose is worth celebrating! If you’re looking for ways to observe Banned Books Week, which runs from September 22 to September 28 this year, the ALA’s website dedicated to reading and intellectual freedom is a great place to start. Below, we've outlined a few other ideas as well. Happy reading! Looking for a way to celebrate the right to read in your area? Check out the Banned Books Week Events page for a list of happenings at libraries and bookstores around the country. Don’t see an event near you? Start your own. Make distracting services like Facebook, Twitter, and Instagram work for you by using them as platforms to examine and discuss censorship. Start by reviewing a list of frequently challenged books with students. Help your younger child pick an appropriate book for story time and take teenagers to the library so they can check out a copy of a book that sounds compelling. Then post a picture of your child with her nose buried in these “controversial” volumes. Invite her to write a captions for the picture to share her thoughts about the book or the idea of censorship. If you tweet, be sure to use #bannedbooksweek to ensure your child’s post is associated with this event. Speaking of social media, the Banned Books Week organization has established a dedicated YouTube channel to allow readers from all over the world to submit videos in which they explain why the freedom to read is valuable to them and read a short excerpt from their favorite banned book. To add your voice or your child’s voice, visit the site to learn about the criteria for participation and fill out the form for video submission. Love intellectual freedom but not exactly a bookworm? Consider arranging your own film festival to explore the topic of censorship through film. Alone or with students or friends, watch a selection of fictional films and documentaries from an ALA list, such as Good Night and Good Luck, Inherit the Wind, Smothered, and Tell It Like It Is. Turn freedom into a fashion statement! You can make this simple by helping kids use fabric paint to design their own tote bags or t-shirts promoting the idea of the right to read or their favorite banned book. Alternately, you can turn to the pros. Some of our favorite banned book products include a bracelet made of tiles displaying the covers of various banned books; a tote bag from New York’s iconic Strand bookstore; and a large selection of bookish merchandise from Out of Print, including t-shirts, phone cases, stationery, and more.